More than 50 local runners (40 are track club members) participated in the 32 Annual Gate River Run on March 14. It is the USA 15K (9.3 Miles) championship, and features some of the world’s top runners. The Overall winners are former Olympians, with world class speed. This is evidenced by Anthony Famiglietti’s winning time of 43 minutes and 36 seconds. The top female was Amy Yoder-Begley, coming in at 49:51. But with over 12,000 finishers, this is definitely the people’s race, and a top event for runners of all ages and abilities. Spectators, volunteers, and musical groups line the course from start to finish. The Hart Bridge continues to be the featured landmark and obstacle, especially since it comes at the latter part of the course. However, upon reaching the top, it is downhill to the finish. 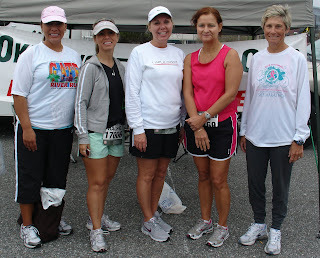 The festivities also included a 5K (3.1 Miles) race and 5 local ladies are all smiles after the Run for Charity. A Great Swamp Run Compliment!